This sewing technique is designed for lightweight fabrics where a facing would be too heavy, or show through the fabric. It is my preferred method to finish the necklines or armholes of bias cut silk or viscose chiffon. This technique is a high-end finish and does require an experienced hand. It is important to note that this finish is only suitable for use on fabrics that hold a press well. Viscose, silk and linen are all suitable fibres for this technique. It won’t work well in fibres like polyester or nylon. In this demonstration I will invisibly bind the armhole of this sleeveless top. This garment is a little different to normal, as the shoulder seam is sewn after binding the armhole, but this technique is just as easily sewn on a closed armhole by joining the ends of the binding first. To make the binding pattern, measure the length of the armhole/neckline along the stitching line. Mark the location of any notches, and intersecting seams, and add a seam allowance to the ends where the binding is to be joined. I recommend cutting the width of the binding 4cm wide for your first attempt – this results in a 1cm finished binding. For sheer fabrics I prefer a daintier finish and cut a narrower binding resulting in a 6mm finish – but see how you go with a wider binding first! Another important note – the binding needs to be cut on the true bias. (I know the right and wrong sides look very similar in this printed fabric. To help you recognise which is which, the black appears less dense on the wrong side). This is where the clipping you did previously does its work, and the bias binding moulds to the armhole shape. The binding needs to be tacked in place at any seams. My top only has one seam at the underarm, but you can tack at all seams on your garment. I stitched in the ditch by machine, but you could tack by hand if you prefer. The finished binding on the inside is almost as pretty as the outside. Because the fabric is viscose, silk or linen, it stays in position when pressed, the binding ‘floats’ in place – just like magic! So there you have it – a beautiful bound finish on the inside, with zero stitching visible from the outside. 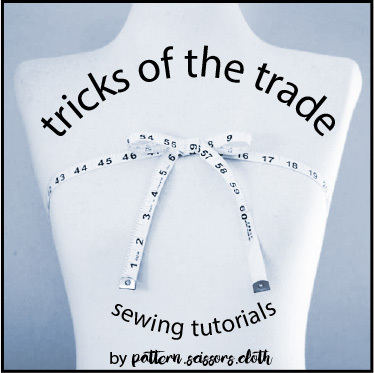 I hope you’ll find this a useful technique to use in your sewing one day! This is fantastic, Sheryll! Thanks for sharing. Perfect timing for me as I eye up the Liberty silk I found yesterday. Last time I sewed silk I swore ‘never again’ – but I’m ready for another round! Thank you, perfect timing. Even though it’s freezing cold outside, and snowing, I’m sewing a sleevless rayon dress and my armholes will now have a perfect finish! Thank you , Sheryll! Allways handy to have another method . You certainly got my attention with your title. What a wonderful finish for edges. Just when I think I know everything (ha!) … Come to think of it, I do believe I have seen this finish before. I’ll certainly try this on the first possible candidate in the sewing queue. Thank-you for the instructions! This is really interesting! I can’t wait to try it out on my next silk/linen/viscose garment candidate. Thank you! Magic! Thanks so much for this – I’m going to have a go asap. What a beautiful slick technique! Filing this one in the memory banks!!! Thanks for sharing this. I hate using facings but sometimes you don’t want a stitching line either so I really appreciate it and can’t wait to give it a go! Hi Sheryl, am so excited to try this method. Have got a few silk tops to make, so this will be a great finish. Thank you so much for sharing your expertise with us all – very appreciative!!! Will be sharing this method with my sewing pals. Great post!!! Thank you so much for sharing it is very much appreciated. Oooh, I have just the pattern to try this on! Thanks! Oh nice! Just think I have a nice bundle linen I ordered. I’ll try this out in the Spring. My sewing is in it’s own building, but in the New Hampshire winters, I can’t get though the snow to get to it. What a cool technique! Thank you for sharing! Thank-you so much Sheryll for yet again sharing your knowledge. I will definitely be giving this method a go. Very tidy – thank you. I have not seen this technique before and will definitely try it. . So cool! I wouldn’t have thought to try this on my own because it seems like it shouldn’t work. Now I will. Excellent -shall use this very soon. Thanks so much!